Having a family Advent calendar is a lovely Christmas tradition, and the most traditional form of an Advent calendar is one made from fabric, usually felt. An Advent calendar starts on December 1, and counts down the days until Christmas Day (or through Christmas Eve). This is an especially poignant tradition for families with young children, who are quite excited by the Christmas holiday, and can help capture their attention and imagination each day with the counting to Christmas. A fabric calendar is usually easy enough and flexible enough for the youngest child to handle, so it makes an interactive way for children to use all of their senses in preparation for Christmas. They can touch, see, and feel the Advent calendar. 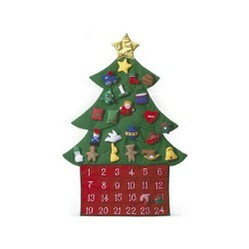 Most Fabric Advent Calendars come in traditional Christmas shapes and themes such as the Christmas Tree, Santa Claus' Wordshop, Nativity Scenes, and Snpwmen. You can buy already made fabric Advent calendars, some created by well known artists, or you can make your own from a kit. Making your own will allow for personal touches that you can include. Deciding which Fabric Advent Calendar to buy can be a hard decision. Some families have one Advent calendar for each family member which allows young children to keep track on their own. This page has listings for just a few of the choices available. You can click through to Amazon for a much larger selection of Fabric Advent Calendars, and Fabric Advent Calendar kits. Santa's Workshop is one of the most appropriate themes for an Advent calendar as you and your children can imagine exactly what Santa and the elves are doing in preparation for the Christmas holiday, just as you and your little helpers are also preparing for the holiday. The idea of stretching the Christmas holiday out to the preparations is a lovely theme, because no big event is accomplished in one day or by one's self. Having the help of others and working together towards the holiday celebration is a wonderful lesson for your youngsters to learn as they enjoy getting ready. They can also come to appreciate family participation, and just being together as they prepare along with you. Mary Engelbreit Advent Calendar Felt Applique Kit: 15x48"
Package includes patterns and instructions for advent calendar 27" L, stocking 28" L & door hanging 27" L.
If you can spare the time, and have some sewing ability, making your own Christmas Advent calendar, or making several for your family members is a fun activity that will give you the opportunity to personalize each one with special surprises just for that person. There are kits with all of the items and supplies that you will need along with instructions, or you can make it from scratch using your own materials, and ideas. There are several books on this topic, and I have included the best one on this page for you to take a look at. You may also have an Advent calendar sewing pattern that has been handed down in your family or in your church that you can use to make the Advent calendars for your family. If your children are old enough, including them in this creative activity will make it even more fun for them. Advent calendars are very meaningful. We always had one as children and our children enjoyed them, too.